I picked up Joy for a couple reasons. The first, one of my favorite narrators posted about how much he enjoys Poe’s writing and was excited about signing on to narrate one of the author’s novels. The second, the cover captured my attention completely and the blurb was one I could not pass up. While I have no idea how representative this States of Love novella is of Poe’s writing style, I enjoyed the heck out of it because watching Gideon find himself after he gets lost in small town New Hampshire was a ride I’m glad I got to take. When Gideon Joy proclaims himself to be the unluckiest man “this side of the Rockies” after a run-in with a moose – literally – he isn’t exaggerating. The boy has bad luck in spades. Yet Poe avoided using Gideon’s bad luck as a way to garner cheap laughs. Instead, readers are treated to a serious story as Gideon comes to realize that the life he left behind in California is one that he doesn’t have to return to and that home isn’t just a place, it’s also the people who live there. And Lancaster, New Hampshire has a wonderful collection of characters who not only make Gideon feel welcome, but make him a part of their tight-knit community. Add to that a hot mountain of a man who is totally not Gideon’s type, yet appeals to him in a way no one has before and that has Gideon reconsidering his plans to return to California once he’s paid for the repairs to his and Silas’s cars. Of course, that decision would be easier to make if his patently bad luck didn’t keep rearing its damaging head every time he and Gideon went on a date. And yes, I did find myself chuckling a time or two at Gideon’s expense. Even though the story takes place over the span of just a few weeks (as best as I can determine), Poe somehow manages to avoid the insta-lust or insta-love feel. Perhaps this is because the story is more focused on Gideon finding a path in life, one that includes the beginning of a relationship with Silas. In fact, even though he (technically) moves in with Silas within a week of their fender bender, we never see the two do anything more than kiss and flirt. I kind of enjoyed that fact that even though Gideon is obviously a flirt and has no objections to jumping straight into bed with someone he’s attracted to, he takes things slow with Silas, recognizing that there is the potential for something long-lasting between them. Despite its novella length, Poe manages to pack a lot into Joy and I enjoyed it so much that I would love for the author to revisit the couple and the good people of Lancaster, New Hampshire. 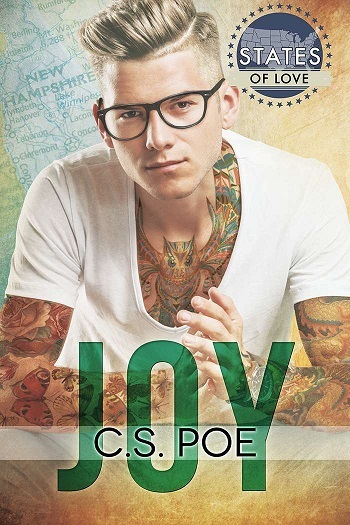 Reviewers on the Wicked Reads Review Team were provided a free copy of Joy (States of Love) by C.S. Poe to read and review.